Not surprisingly, demand for 4K ultra-high-definition (UHD) display equipment has surged as the amount of content has gone up and costs have come down. Moving forward, new and innovative technology solutions will come into play, accelerating growth even further by enabling creative applications not possible until now. Applications based on projection technology are pushing 4K UHD displays beyond the traditional early adopters in home theater, business, and education markets. 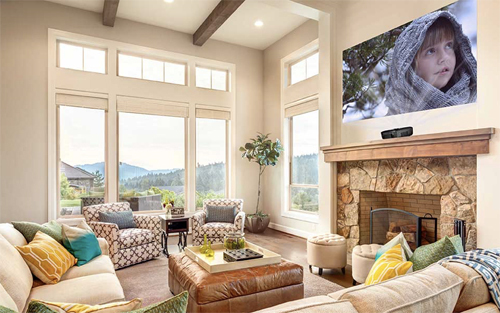 Designers are beginning to focus their application development efforts on innovative products like short- or long-throw 4K UHD projection displays in small, mobile form factors that also support streaming video on demand (SVOD). 4K UHD content with over 8 million pixels per frame - more than four times that of standard high-definition (1080p) displays - is simply much more immersive, attention-grabbing and compelling. Of course, with four times the resolution, it's reasonable that the size of the image on the screen might become larger to better display all of that detail. For both large and small displays, it's important to show the full 8.3 million pixels in order to truly be classified as 4K UHD. To really leverage the detail available in 4K UHD content, the display system must be capable of excellent image processing, with great American National Standards Institute (ANSI) contrast. The imager must have fast switching time and impeccable mechanical alignment. Images with a high ANSI contrast have very dark blacks and very bright whites in the same picture, indicating the image's true contrast level. Some technologies quote other data points to indicate image contrast, but these contrast options don't deliver both dark blacks and bright whites in the same picture. For example, a simple "on/off" contrast metric compares an all-white screen to a dark screen, but since real images are viewed in a single picture, it's critical to have the darkest blacks and brightest whites in the same image. With great ANSI contrast, images look sharper and crisper, resulting in a more immersive display. At the heart of any projection system is one or more imagers and the pixels on the screen are created by these elements. Many projection technologies use separate imagers to project each of the three primary colors, red, green and blue, but this gives rise to concerns about alignment. 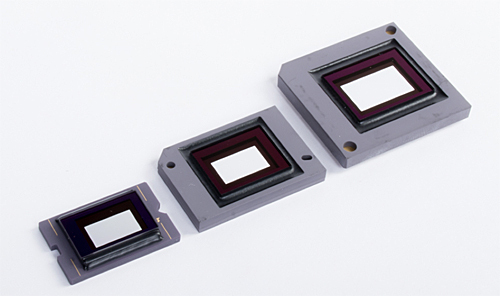 The imagers, each for a different color, must be in exact alignment so that the color of each pixel is accurate and crisp. Especially as pixels have continued to decrease in size with advances in display technology, it has become increasingly complex to align the imagers during manufacturing. A simple test to detect misalignment is to look closely at white text on a black background. If tiny specks of red, green or blue are visible at the edges of the letters then the projection system is probably out of alignment. With Texas Instruments 4K UHD DLP® technology, the picture element consists of just one imager, a chip with millions of micromirrors each about the size of a human blood cell, ensuring perfect pixel alignment. With all of the detail and vibrancy that comes with 4K UHD content, it's important for any 4K UHD projection system to display every last bit of it. Unfortunately, some supposed 4K UHD projection systems actually deliver less than the 8.3 million pixels specified by the Consumer Technology Association (CTA). In fact, some deliver as few as 4 million pixels. DLP technology projection systems incorporate advanced image-processing algorithms to project over 8 million pixels on the screen and craft a clear, crisp, precise 4K UHD high-resolution display. 4K UHD projection systems will be extremely beneficial to the traditional use cases for projectors in business, education, and home theater, but it won't stop there. Of course, clearer, crisper, more legible spreadsheets projected in business conference rooms around the world will be greatly appreciated by those sitting in the back of the room. And in the classroom, teachers stand a better chance of keeping the students' attention with compelling 4K UHD content. And for home theater buffs, what's not to like about bigger, brighter, immersive screens showing images in all the splendor of 8.3 million pixels at a more affordable price point? But beyond the applications that have historically driven the projector market there are many exciting and engaging applications made possible by smaller, power-efficient and cost-effective chipsets. Several of these applications, like mobile smart TVs and laser TVs, can include streaming video content; others, such as digital signage, can be incorporated into retail or industrial design in novel ways. Developers are also coming up with new ways of using 4K UHD projectors, like embedded in smart home appliances or in gaming displays. Mobile smart TVs and laser TVs are rapidly changing the way consumers experience home entertainment. Because of their compact size and optics, these systems can be placed in many different environments allowing consumers to display vibrant video practically anywhere in their homes. With short-throw optics a mobile smart TV or laser TV projection box can be placed just inches from the wall or screen. The displays could be set on a mantle above the fireplace in the living room, while the next day it might be in the game room or outside in the backyard, projected onto an outside wall. The choice between mobile smart TVs and laser TVs depends on the user's viewing habits. While both mobile smart TVs and laser TVs can support screen sizes greater than 100 inches, a mobile smart TV is a more compact system typically driven by light-emitting diodes (LEDs). Portability, mobility and ease-of-use are key advantages for these products, along with the application processors that enable streaming video content. Laser TVs are illuminated by lasers; as a result, these units offer greater brightness levels up to 5,000 lumens and enable larger screen sizes. Many times, laser TVs are paired with special ambient-light rejection screens to further enhance the viewing experience. Signage has long been thought of as a fairly straightforward way of communicating information. But with the advent of digital signage, real-time 4K UHD content, and advanced projection displays, signage has become not just more engaging for consumers, but - importantly for businesses - more compelling and persuasive. A store in a mall might project an attention-grabbing video along with real-time pricing information onto translucent film in the display window. Museums might stream a video on the wall next to a painting that explains how the artist accomplished such a masterpiece or even incorporate projection mapping onto sculptures. High-resolution projection technology is being used in new ways that would have been hard to imagine not long ago. The same DLP technology found in most digital movie theaters is making this broad range of 4K UHD applications possible. At the heart of DLP technology is a digital micromirror device (DMD) with millions of fast-switching tiny mirrors. DLP technology combines this switching speed with advanced image processing algorithms to display multiple pixels on the screen for every micromirror on the device. To meet the needs of developers across the entire spectrum of applications, each of the various DLP chipsets is optimized for certain characteristics. It is undeniable that 4K UHD projection displays can be breathtaking in the richness of their colors, the crispness of the details and the captivating vibrancy of the images. Now, with new technology solutions making such displays more compact and affordable, a wide range of exciting new 4K UHD applications is on the verge of exploding well beyond the limits of the past. I am very curious to wait for the real bt2020 color space plus 3d support in new projectors. We know that the HDR is way to achieve it. But many people in world want the most future proof items. They have not enough money to buy another projector just after a couple of years. So I'm keeping my eyes on every launching. And Projector Central aka P.C. is more than enough to help me in every aspect.